A couple of months ago, I was low on eye creams. I thought about ordering some from overseas but decided to shop my own stash first, since I have quite a lot of products. Surprisingly, eye creams are one of the products I don't have much of, but I did manage to find this Morningtree product which claims that it can be used as an eye cream that can de-puff and lighten dark circles. Why not, I thought. Admittedly, the name threw me off because no where on the front of the packaging does it mention it as an eye cream. 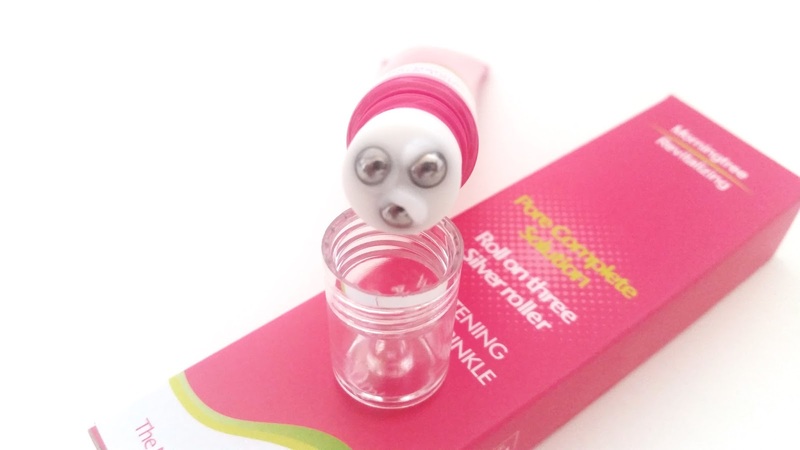 However, this seems to be a multi-functional cream and the roller applicators do remind me of eye cream rollers. In fact, this cream can be use all over the face as well, as it helps to provide brightening and anti-wrinkle properties. Product Description: A gel like cream stored in an easy to use roller applicator to help soothe and cool the skin during application. The cream is formulated with snail secretion, niacinamide, galactomyces ferment filtrate and more to brighten, moisturize, and provide anti-aging care. This product can be used for the under eye areas to de-puff and lighten dark circles. 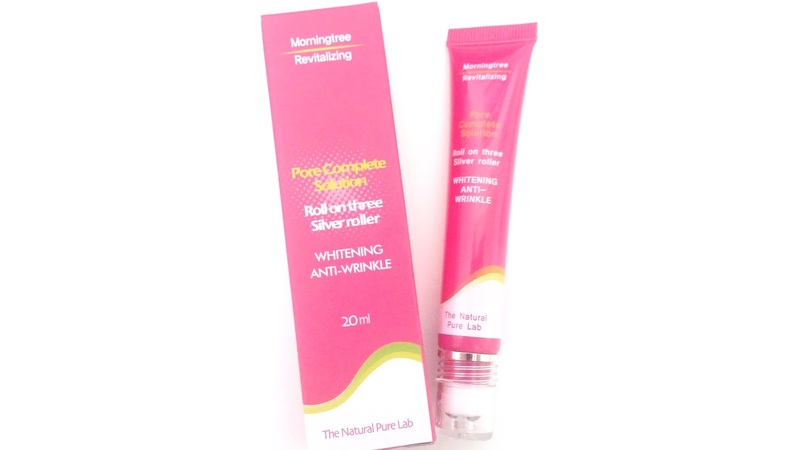 It can be used over the face to provide anti-wrinkle and brightening care as well. To Use: Apply wherever needed. Use the 3 roller balls to roll over the areas to provide a soothing and cooling application. If you wish to apply more of the cream, just squeeze the tube lightly and the gel cream will be dispensed from the sides of the roller balls. Ingredients: Purified water, butylene glycol, grape seed oil, macadamia seed oil, cyclopentasiloxane, cetyl ethylhexanoate, glycerin/ glyceryl acrylate/ acrylic acid copolymer/ propylene glycol, dipropylene glycol, polyacrylamide/C13-14 isoparaffin/ laureth-7, caprylic/capric triglyceride, methyl gluceth-20, niacinamide, glyceryl stearate, beeswax, shea butter, octyldodecanol, sodium hyaluronate, squalane, snail secretion filtrate, copper tripeptide-1, oligopeptide-1, sodium chloride, stearic acid, sorbitan sesquioleate, vitamin, dimethicone, olive oil, arginine, 1,2-hexanediol, fragrance, tocopheryl acetate, centella asiatica extract, xanthan gum, caprylyl glycol, aloe vera leaf extract, allantoin, mulberry root extract, licorice extract, portulaca oleracea extract, ginkgo biloba extract, panthenol, disodium EDTA, adenosine, bifida ferment lysate, galactomyces ferment filtrate. Please Do Not use if you sensitive to any of its ingredients. Packaging: The packaging of this product is pretty simple with a pop of magenta as the main color theme. The ingredients are all in Korean, but I did translate them and you can find it above. The unique part about this product is its roller applicator which come with 3 silver rollers. These makes the application easy and also provides soothing and cooling effects as well. Scent: There are fragrances added to this product. It smells floral like. It has just a hint of herbal scent but not super noticeable at all. The scent is more than mild and can be overwhelming for some. Color: The gel cream is milky in color. Texture: The gel cream is very light and absorbs easily. Can feel a little sticky afterwards but goes away after a while. The gel cream comes out from the sides of the roller balls. My Thoughts: When I first started to patch test this product I thought I wasn't going to like it. However, it turned out pretty well. I thought I wasn't going to like it because it leaves a bit of stickyness after the applications. Although it eventually goes away, I thought it would hinder my makeup applications. Surprisingly, it doesn't. While this product can be use all over the face, I've only used it as an eye cream for now and only for the morning times. I would store this in the fridge, so the cream is nice and cool in the morning. 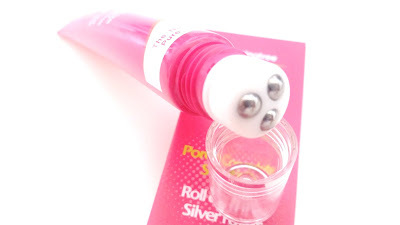 Add in the silver rollers, it provides an extra cooling kick that helps to de-puff the eyes and prep it for makeup. I will say that this isn't a magical puffy-eye-be-gone kind of product but it does help. It also helps to brighten the under eye areas a bit, so the dark circles don't look so dark. The gel cream also helps to provide moisture and nourishment to the under eye areas. Although, it's not as moisturizing as I would like it to be which is why I only use it in the morning times and use something else for the evening times. The gel cream does provide some anti-aging care as wellbut its effects are minimal. My only dislikes of this eye cream are its scent and that personally, it's not moisturizing enough for me. The gel cream does feel a bit moisturizing when it's applied, however, the feeling does not last. So I only use this in the mornings and use another eye cream that's more moisturizing for the evening times. The other issue is the scent. It's not a bad scent. The floral fragrances with just a tiny hint of herbal mix doesn't smell bad. However, it can be a bit strong. Final Thoughts: This Morningtree Revitalizing Pore Complete Solution turned out better than expected. I've been using it as my morning eye cream for the past 2 months and it's pretty decent. I still think the scent is a bit too strong and it's not as moisturizing as I would like. However, it helps to de-puff and reduce under eye circles which is why I've kept using it. Would I repurchase this in the future? Maybe not. I really like the roller applicator and the de-puffing and reducing dark circle effects are really nice. However, there are some things I don't really like about this eye cream due to personal preferences, so it's not a product that I might come back to. I do want to try other eye creams with roller applicators because it feels really nice in the morning! Do I think this is worth a try? Possibly. If the properties this eye cream offers are what you are looking for, then it is worth a try. 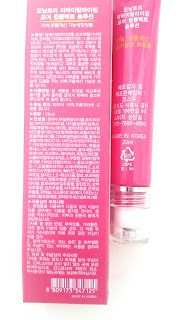 This eye cream is a bit hard to find and I've only found it on Korean shopping sites that don't ship overseas. So if you do want to try this product, you would need to purchase it through a shopping service.